This entry was posted in Safety gear & equipment on 2016/07/27 by Susan. wearing a Mustang Elite inflatable PFD. Wearing a personal flotation device (PFD) can save your life. No doubt you’ve heard that before. WorkSafeBC requires workers to use a PFD when working on the deck of a fishing vessel where the work process exposes the crew to a risk of drowning. That said, many fishing industry workers still choose not to wear one. I wondered why and asked Ryan Ford, Program Manager of Fish Safe BC. He said there were many reasons and he’d give me the top two. Number 1 is complacency, he said. “Human nature is such that many feel that if a bad thing hasn’t happened to them in the past, it probably won’t occur in the future,” Ryan said. Fish Safe BC runs a Safest Catch workshop that is free of charge to all BC commercial fishermen. “We try to overcome this thinking in our programs by having down-to-earth, non-confrontational conversations about actual incidents that involved experienced fishermen losing their lives due to falls overboard. 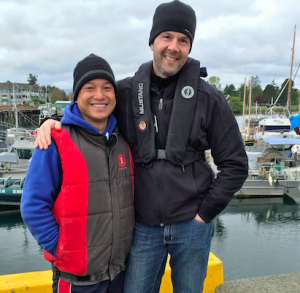 Falls overboard along with vessel stability issues are among the biggest risks to fishermen regardless of experience,” Ryan said, describing the program created by and for people in the fishing industry. The second reason people don’t use PFDs is they find them too hot or bulky. Others say they can snag on objects as they work on the vessel. People have lots of options in PFDs now that are both easy to work in and compliant with WSBC requirements. Do you have one to recommend?